Advances in Cancer Research, Volume 139, provides invaluable information on the exciting and fast-moving field of cancer research. 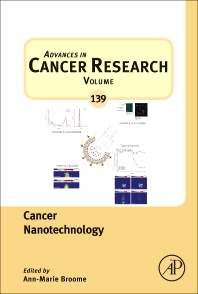 Original reviews are presented on a variety of topics relating to the rapidly developing intersection between nanotechnology and cancer research, with unique sections in the new release focusing on Exosomes as a theranostic for lung cancer, Nanotechnology and cancer immunotherapy, Ultrasound imaging agents and delivery systems, Dendronized systems for the delivery of chemotherapeutics, Thermosensitive liposomes for image-guided drug delivery, Supramolecular Chemistry in Tumor Analysis and Drug Delivery, Gold nanoparticles for delivery of cancer therapeutics, and Single cell barcode microchip for cancer research and therapy. Ann-Marie Broome directs the Broome Translational Medicine & Nanotherapeutic Lab which integrates molecular biology, molecular chemistry, and molecular physics to bioengineer molecular imaging agents and bio-mimetic drug delivery vehicles. Their research team combines expertise in areas of nano-material design, cell engineering, biomarker imaging, immunology, surgery, and oncology in order to develop multi-functional nanoparticles. The overarching premise of this research is that it is possible to create multifunctional nano-therapeutics and post therapy monitoring tools with an emphasis on the development of a reliable nanotechnology-based solution for those organs where disease is characterized by low survival rates.